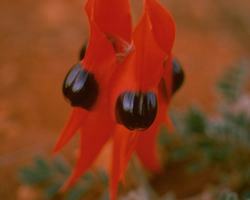 Sturt Desert Pea is the floral emblem of South Australia. It is for deep hurts and sorrows. I have come across at least three Aboriginal legends connecting this flower to grief and sadness. This is one of the most powerful of all the Essences and, like so many of the Bush Essences, it can help the person bring about amazing changes in their life.